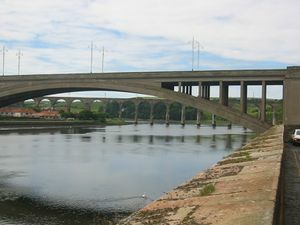 بريك-أپون-تويد Berwick-upon-Tweed ( /ˈbɛrɪk əpɒn ˈtwiːd/) بالغالية الاسكتلندية: Bearaig a Deas) هي مدينة في مقاطعة نورثمبرلاند شمال إنگلترا، على الساحل الشرقي في مصب نهر تويد. وتقع على بعد 2 كيلومتر ونصف (4 كم) إلى الجنوب من الحدود الاسكتلندية. ذلك هو ما يقرب من 56 ميلا الى الشرق والجنوب الشرقي من إدنبرة، و65 ميلا الى الشمال من نيوكاسل أبون تاين و 345 كيلومتر الى الشمال من لندن. Berwick-upon-Tweed from across the river. 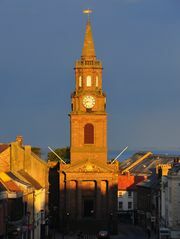 The Town Hall (1754) houses a ring of bells above the Council chamber and a former gaol. Burnett, George (ed.) (1886). "vol. 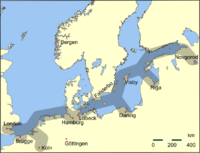 IX: 1480–1487". The Exchequer Rolls of Scotland. Edinburgh. pp. 63/4. 81, 145 & 157. 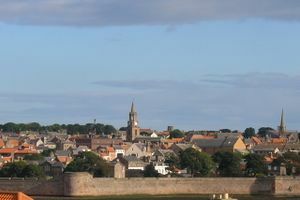 CS1 maint: Extra text: authors list (link) Record that payments were made to Robert Lauder of The Bass as Captain and Keeper of the castle at Berwick-upon-Tweed in 1480 and 1481. Hewlings (1993). "Hawksmoor’s Brave Designs for the Police". In Bold, J; Cheney, E. English Architecture Public and Private: Essays for Kerry Downes. London: Hambledon Press. pp. 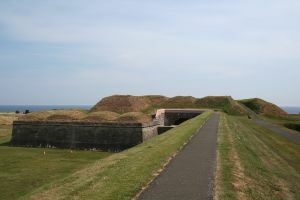 214–229. ISBN 1-85285-095-7. 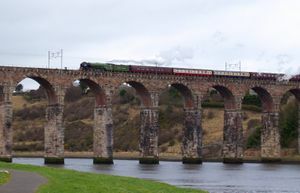 مشاع المعرفة فيه ميديا متعلقة بموضوع Berwick-upon-Tweed. 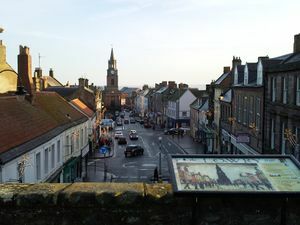 A tale of one town – 2004 BBC news story concerned with a tongue-in-cheek debate about whether Berwick should be part of England or Scotland. The Scotsman: We can learn a lot from Scotland's "lost limb"